As believers, we celebrate the risen Christ. 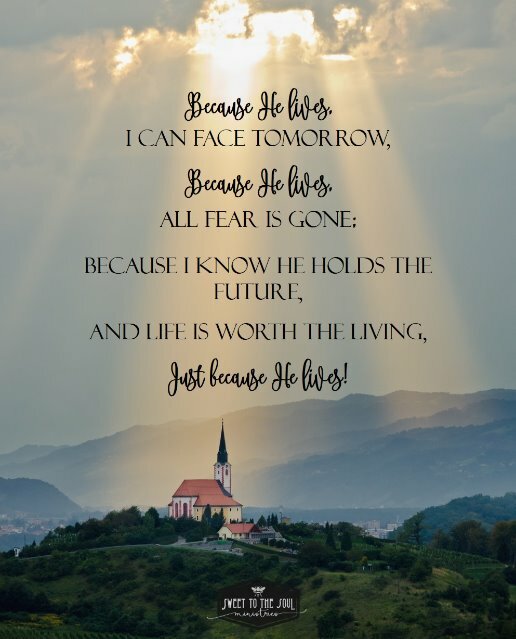 “Because He Lives” is built on this strong foundation. When we know that we know that we know that Jesus Christ is risen from the dead, our lives are forever changed. When I think of this song, my mom’s brother, Uncle Ray, comes to mind. He died in 1982, too soon, at the age of 50 because of the leukemia that ravaged his body, but could not touch his soul. This was his “victory” song. During his battle with cancer and his many hospital stays, Uncle Ray’s attitude was amazing. Rather than you cheering him up, he was the one who was so encouraging. Often his laughter would tumble out of his room as you walked down the hallway. You might find a friend or family member inside or someone from the hospital staff, God’s love touched all who came in contact with him. Uncle Ray was a farmer, a legacy that was passed along to him by his father. As you know, farmers work hard. So much of their livelihood, including the weather and economic conditions, is beyond their control, truly they live by faith. They do the best they can, pray a lot, and leave the outcome to God. It was that same faith that would sustain him through the years he battled the cancer. If you have ever walked with someone through a terminal illness, you know that you fight and you fight and then the day approaches when the battle comes to an end. When it was Uncle Ray’s time to go, the truth of this song was our comfort. Why? Because we knew that he would see the lights of glory and know beyond a shadow of a doubt that Jesus lives. As the hospital was just waking up one morning with the Prayer of St. Francis of Assisi echoing through the hallways, “Lord make me an instrument of your peace, where there is hatred, let me sow love; where there is injury, pardon; where there is doubt, faith; where there is despair, hope; where there is darkness, light; and where there is sadness, joy.”, Uncle Ray was waking up in heaven seeing Jesus, His Lord and Savior, face to face. There was no longer any sadness for him, only joy. No longer sickness, only health. At Uncle Ray’s funeral we sang, “Because He Lives”, his favorite song, his victory song. With tears streaming down my face, I knew that every word was true. That in spite of this great loss, I knew that God also held my future in His hands and life was worth the living just because Jesus lives. Today you may be at the crossroads of your life. You may not know Jesus and his victory over death or it may be the first Easter Sunday that you fully understand the tremendous power and promise of the empty grave and the Risen Savior. Celebrate the fullness of this joy! With Christians around the world, take hold of the truth that Jesus came to love, heal and forgive, an empty grave is there to prove my Savior lives. 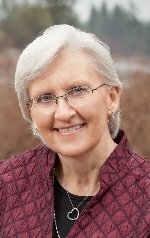 ​Barbara Hollace is an author, editor, speaker, and Communications Director at Spokane Drea​m Center. She is involved in women’s ministry and is passionate about prayer and its power. God’s call on her life is to ‘identify the good and magnify it’ in her business, personal life and ministry. To find out more about her, visit www.barbarahollace.com or find her on Facebook (Barbara Hollace Author.Editor.Speaker) Barbara and her husband make their home in the Pacific Northwest.